Even in the future of law enforcement there is room for improvement. Robocop returns to fight his toughest opponent yet: his replacement! Filled with "explosions and hundreds of thousands of rounds fired by automatic weaponry" (Variety), Robocop 2 pits two unstoppable cyborgs against each other in a battle to the death that will leave only the strongest standing! When Detroit's decent into chaos is further compounded by a police department strike and a new designer drug called "Nuke," only Robocop can stop the mayhem. But in his way are an evil corporation that profits from Motor City crime and a bigger and tougher cyborg with a deadly directive: Take out Robocop. Containing the latest gadgetry and weaponry, as wellias the brain of the madman who designed "Nuke," this new cyborg isn't just more sophisticated than his predecessor ... he's psychotic and out of control! And it's going to take everything Robocop has - maybe even his life - to save Detroit from complete and utter anarchy. $14.100 million on (unknown) screens. After 1987’s Robocop emerged as a surprisingly clever and innovative take on its genre, fans like myself expected a lot from its sequel. 1990’s Robocop 2 lost the participation of director Paul Verhoeven as well as writers Ed Neumeier and Michael Miner. However, it retained the main cast members and brought in veteran director Irvin Kershner and notable comic book writer/artist Frank Miller. The latter inspired the most optimism in me, as I loved Miller’s work via titles like Daredevil and The Dark Knight Returns. Too bad all hope for Robocop 2 became unfounded, as the sequel offered nothing more than a cheesy echo of the original. Like the first flick, Robocop 2 opens with a “Media Break” that gives us some basic background information. We learn that designer drug “Nuke” plagues Detroit, and evil Cain (Tom Noonan) leads the Nuke cult. The Detroit police are on strike, but oddly, Omni Consumer Products (OCP) - the group that runs the force - seems to want this to continue. Crime runs rampant, and almost only Robocop (Peter Weller) remains on the prowl. He hunts the creator of Nuke and takes out a lab. Robo also stalks his old family: wife Ellen (Angie Bolling) and son Jimmy (Clinton Austin Shirley). She sues OCP because of the emotional distress this causes. OCP forecloses on Detroit and plans to take over the whole city if Mayor Kuzak (Willard Pugh) can’t pay them. OCP wants this so they can remake Detroit in their own way. They also create Robocop 2, a new model with some glitches, as they all go nuts from emotional issues. OCP needs to find another candidate ala Murphy with the same strengths, and Dr. Juliette Faxx (Belinda Bauer) heads up the hunt. In the meantime, Robo and partner Anne Lewis (Nancy Allen) track Nuke-peddling youngster Hob (Gabriel Damon). He shot Robo earlier and triggered flashbacks to his son. Nuke-addicted Officer Duffy (Stephen Lee) helps Hob and his crew, as he sells out the cops for money and drugs. Robo gets the location of Cain from Duffy but Hob gets away. Robo follows to Cain’s hideout, where they halt our hero and crack him open. They toss the pieces on the picket line and leave Robo barely alive, but OCP doesn’t want to pay for repairs. They eventually do so, though Faxx continues the search for Robocop 2. She comes to feel psychopaths would work best, and when Cain buys it, he becomes the personality of Robo 2. The original Robo needs to deal with him, stop the spread of Nuke, expose the nastiness at OCP, and generally save the day. I saw Robocop 2 theatrically back in 1990. While I know I didn’t like it, I didn’t recall much else. Lord, how could I forget something so cheesy? Although I was tempted to watch all three Robocop flicks back-to-back-to-back in one long session, I chose to skip the first film and save it for last. I did this to let myself view the two sequels with a more open mind. I love the original movie and didn’t want my impressions of the sequels to be tainted by such direct comparisons. It didn’t help. For one, the script jumps all over the place and lacks almost any coherence. The original movie’s heart came from Robo’s search for humanity, and the sequel seems to attempt to further explore that theme at the start. We see Robo’s stalking of his family and the pain on both sides, but then this thread simply vanishes. 2 can’t even figure out a way to examine that theme logically. Murphy’s widow sues OCP due to emotional distress, but she then visits Robo and views him compassionately. Huh? Essentially the movie simplifies the emotional arc of the first flick into simple soundbites. Other elements came and went at random. The concept of the foreclosure on Detroit popped in and out whenever the movie felt it was necessary, but it played no more significant role than that. And why did the OCP folks show the Old Man the film of all the failed Robocop 2s? It makes no sense, and the scene exists only to give the audience the perverse attempted comedy of the sequence; it doesn’t fit into the film logically at all. 2 presents a more comic book feel than the first flick, and I don’t mean that in a positive way. It makes Robo more of a stereotypical superhero without much depth. The movie seems campier and without the same emotional arc and pathos. Much of the criticism leveled upon the film relates to its portrayal of children. The young character of Hob seems terribly anti-social and nasty, and we also see scenes such as the one with a violent gang of Little Leaguers. 20 years later, these decisions continue to upset folks, but I must admit they don’t really bother me. The whole movie is so tacky and over the top that these instances don’t come across anything unusually problematic. So much of the flick presents such callous and casual gratuitous violence that these bits aren’t anything worse than the rest. Does Robocop 2 do anything well? I must admit I think the scenes with Robo’s altered programming are mildly amusing. He becomes more personable and engages in small talk, both of which don’t match his normally blunt personality. The scenes aren’t great, but they exist as a small oasis of fun in an otherwise tacky flick. Robocop 2 exists as a crummy and tacky experience without much redeeming value. It sullies the reputation of the original and that’s about it. Robocop 2 appears in an aspect ratio of approximately 1.85:1 on this Blu-ray Disc. Across the board, this was an attractive presentation. Sharpness looked solid. Only the slightest hints of softness materialized, as the majority of the flick came across as tight and concie. Jagged edges and shimmering created no concerns – except for the intentionally jaggie “RoboVision”, of course – and edge haloes remained absent. In terms of source flaws, I detected a handful of minor specks but nothing more; the transfer was clean most of the time. Colors appeared positive. The movie presented a bright circa 1990s palette that demonstrated clear, vivid tones. At times, the tones looked quite dynamic, and colored lighting was clear and smooth. Black levels were deep and firm, while low-light shots appeared nicely defined and smooth. This one barely fell below “A” level, but I thought it earned a solid “B+”. I also felt the DTS-HD MA 5.1 soundtrack of Robocop 2 merited a “B+”. The soundfield seemed pretty involving given the film’s era. The forward spectrum presented a lot of well-delineated and nicely localized material from start to finish. All of the action sequences certainly offered plenty of opportunities for that kind of information, and the mix kept the elements appropriately placed and well blended throughout the flick. The surrounds contributed a good deal of audio as well. They tossed in good reinforcement of the score and effects and often presented material unique to the rear speakers. The shots that got inside Robo’s head worked particularly well, and many other sequences used the surrounds to solid effect. They helped create a fine sense of environment. Audio quality seemed a little dated but was generally good. Speech came across as distinct and natural, with no issues connected to edginess or intelligibility. A little distortion occasionally affected some effects, such as during a vehicle crash. However, those elements usually sounded clean and crisp. Low-end was pretty deep and full. The score showed good clarity and brightness. The track wasn’t quite impressive enough for “A”-level consideration, but it landed a strong “B+”. In terms of supplements, virtually nothing appears here. We get two trailers and that’s it. Robocop 2 was a disappointment 20 years ago, and it remains a stinker now. The movie presents an incoherent mess with little positive to say for it. The Blu-ray offers very good picture and audio but lacks any substantial extras. Only super-Robocop diehards will be interested in this stinker, though the Blu-ray presents the film well. Note that the reviewed disc came as part of “The Robocop Trilogy”. 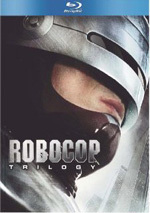 While the first Robocop can be purchased on its own, Robocop 2 and Robocop 3 are exclusive to the “Trilogy” set.